LIKE THE TREE OF LIFE the Enochian Watchtowers are a conceptual model of existence. This model consists of two main parts; one signifies the Earth and is a table made up of lettered squares, 25 columns by 27 rows. The other signifies the Heavens, consisting of 30 concentric circles surrounding and enclosing this grid (see the diagram below). As we shall see, the Circles and the Squares are perfect reflections of one another. Though at first glance this may not look anything like the Qabalistic Tree of Life, the two models in fact work very much the same way. The first things Dee and Kelley were given by the Angels were the Enochian Keys, dictated in both the Angelic language and English. These consisted of 18 Keys meant to be used with the Watchtowers of Earth, and 30 Keys meant to be used with the Aethyrs of Heaven (though technically they were given only 48 Keys total, they were told there was a 49th being held back from them). Next they were given were the 30 three-letter names of the Aethyrs. These Aethyrs enclose each other like the layers of an onion, with the first Aethyr, LIL, being the outermost, and the thirtieth, TEX, being innermost and closest to the Material World. Each Aethyr is ruled by 3 Governors, except TEX, which being closest to the Material World has 4. The names of these Governors are all 7 letters long. Along with each Governor's name, Dee and Kelley were given a Sigil for that name (see the accompanying picture for a sample). The grand total of Governors was 91. Dee was told little about these Aethyrs. But as we shall see, much can be gleaned about them from the Watchtowers. The lettered square at the heart of the circles is called "the Great Table." It represents the Material World, the Earth. The Great Table is composed of four smaller tables, and these correspond to the Four Elements (Air, Fire, Earth, and Water) as well as the Four Directions (East, South, North, and West). Each of these is said to be a Watchtower, occupied by a Great King, his Seniors, and various angelic and demonic beings. These Four Watchtowers stand guard over the material universe, and are responsible for maintaining and governing it. The Watchtowers are connected by a central "Black Cross" of Spirit, the 5th Element or "quintessence." Each Watchtower consists of 12 columns and 13 rows of letters, for a total of 156 letters per Watchtower. Some of these letters are capital, some are lowercase, and two letters per Watchtower are backwards. There are reasons for all of this. Every Watchtower is further subdivided into four quadrants by another cross created by the 6th and 7th columns and the 7th row. These quadrants are each made of 5 columns and 6 rows. Again, there is nothing arbitrary in any of this. Finally, each quadrant contains yet another cross, made by the 3rd column and the 2nd row of that quadrant. See the picture above for clarification. The Black Cross holds only 4 names, but the left side and bottom of the cross mirror the names (see above). The Watchtowers of Earth thus mirror the Heavens. The same 91 Governors who define the Aethyrs define them. Each Watchtower, as it turns out, is made up of exactly 22 Governors. As we shall see, this is vital. The eight reversed letters, however, are a special case. One of them, the "L," wraps "around" to the black cross to make a Governor name. 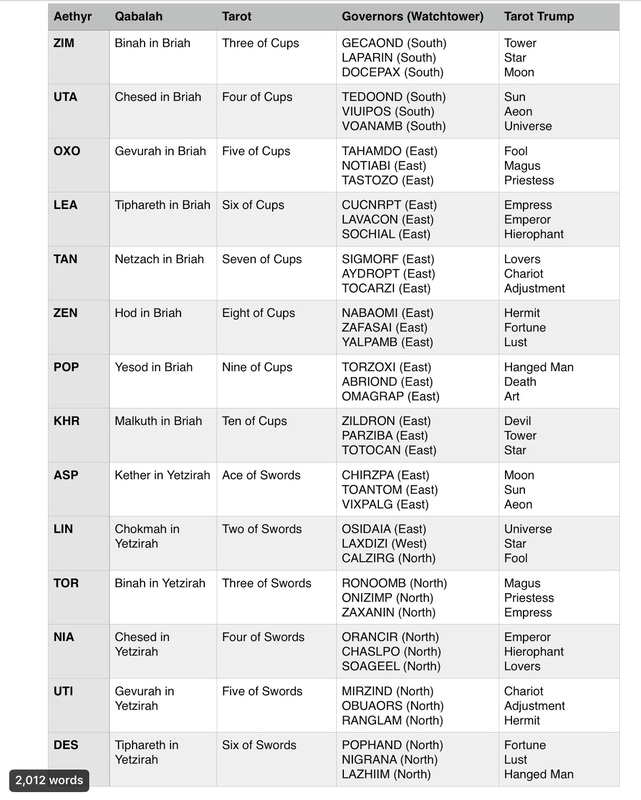 That leaves seven, PARAOAN, unaccounted for. When Dee questioned the Angels about PARAOAN, they were warned each letter of the name is a living fire and the final N is a vial of destruction. When we examine the Enochian Model, it begins to resemble both the Tarot and the Tree of Life in fundamental ways. Partly, this is because the same numbers are in play; 1-10, especially 3 and 7, along with 12 and 22 are all key. The extremely significant Kabbalistic number 13 is also present (we touched on 13 in a broad sense--the 12 edges of the Cube plus the center--but it is very important in Hebrew gematria. 13 is the enumeration of Unity "AChD" and Love "AHVH." Together these make 26, "YHVH," suggesting the nature of God is Unity and Love). But the numbers are only part of the story. Like the Tree of Life, the Enochian universe assumes both a spiritual and a physical dimension, the Heavens and the Earth. Both Enochian and Qabalistic cosmologies postulate a spiritual hierarchy that governs the cosmos. And both incorporate the idea of the Four Elements, the Seven Planets, the Twelve Signs of the Zodiac, and the notion of Heaven as a Sphere and the Earth as a Cube. 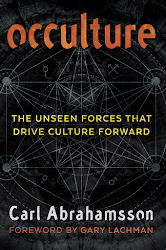 All of this makes it easy to draw parallels between the Tree of Life, Tarot, and Enochian. Consider the 30 Aethyrs. In most schools of Qabalah, there is not one Tree of Life, there are actually four (one Tree for each of the Qabalistic worlds, see below). 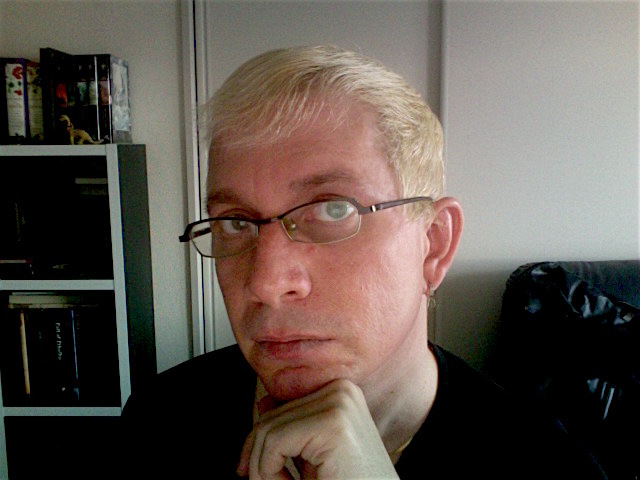 This fits nicely with the Four Suits of the Tarot. The Six of Wands, for example, is Six in the highest world of Atziluth. The Six of Cups is Six in Briah, the Six of Swords is Six in Yetzirah, and the Six of Discs is Six in Assiah, the Material World. 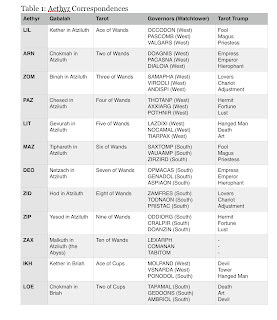 The 30 Aethyrs, likewise, correspond to the Trees in Atziluth, Briah, and Yetzirah. The first Aethyr, LIL, corresponds to Kether in Atziluth, while the Thirtieth, TEX, corresponds to Malkuth in Yetzirah. 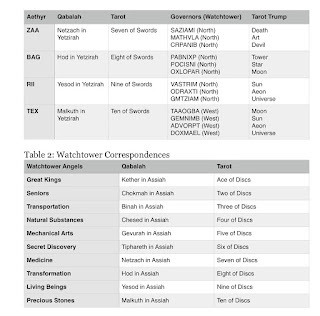 The Fourth Tree is actually hidden in the Watchtowers, which correspond to Assiah, the Material World (as we shall see, there are ten "choirs" of Angels in each Watchtower). These four Trees of Life also have 22 paths each, so theoretically there are four sets of Tarot Trumps, one each for the Fiery world of Atziluth, the Watery world of Briah, the Airy world of Yetzirah, and the Earthy world of Assiah. 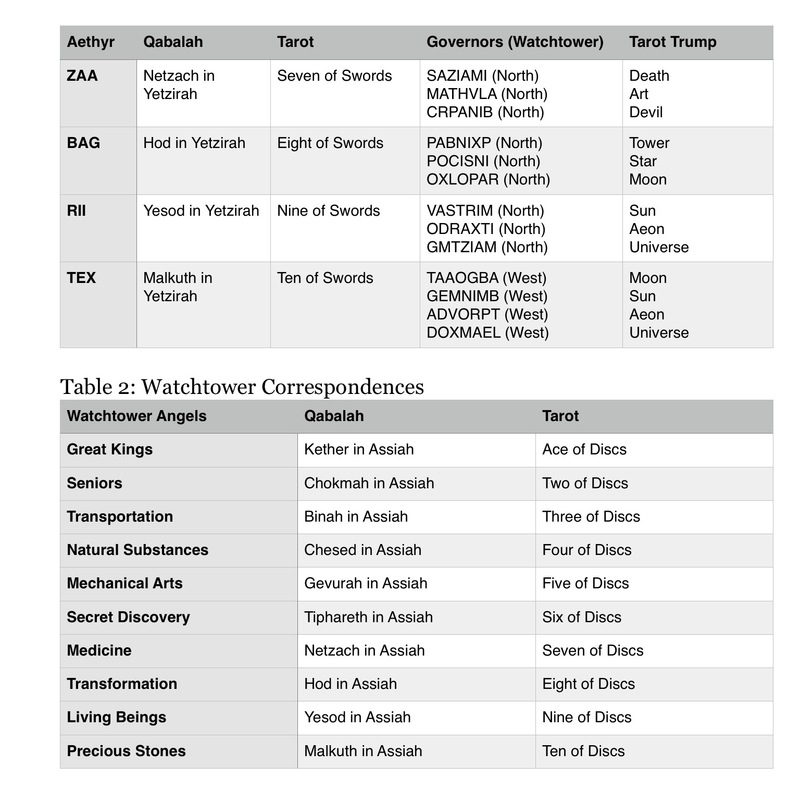 In the Enochian system, there are 22 Governors in each of the Watchtowers, a direct parallel of this. Looking at the Watchtowers, each corresponds to a classical Element, and thus to a Tarot Suit. The Watchtower of the East and Air corresponds to Swords, the Watchtower of the West and Water to Cups, the Watchtower of the South and Fire to Wands, and the Watchtower of the North and Earth to Discs. Each of these, as we have seen, is subdivided into Quadrants, and these correspond to the Court Cards. The Quadrants of the Southern Watchtower, for example, relate to the Knight, Queen, Prince, and Princess of Wands. And again, each Watchtower is home to 10 Choirs of Angels, each corresponding to one of the small cards. The 22 Trumps are present in each as the 22 Governors. In addition to the Watchtower associations above, each tower is itself the Ace, with each of the quadrants relating to a court card. 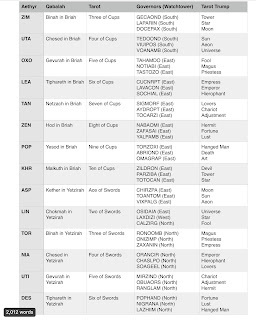 This fact, coupled with each tower being lettered by the names of 22 Governor (each relating to a Tarot Trump) means that the Great Table itself contains the whole of the Tarot in it. 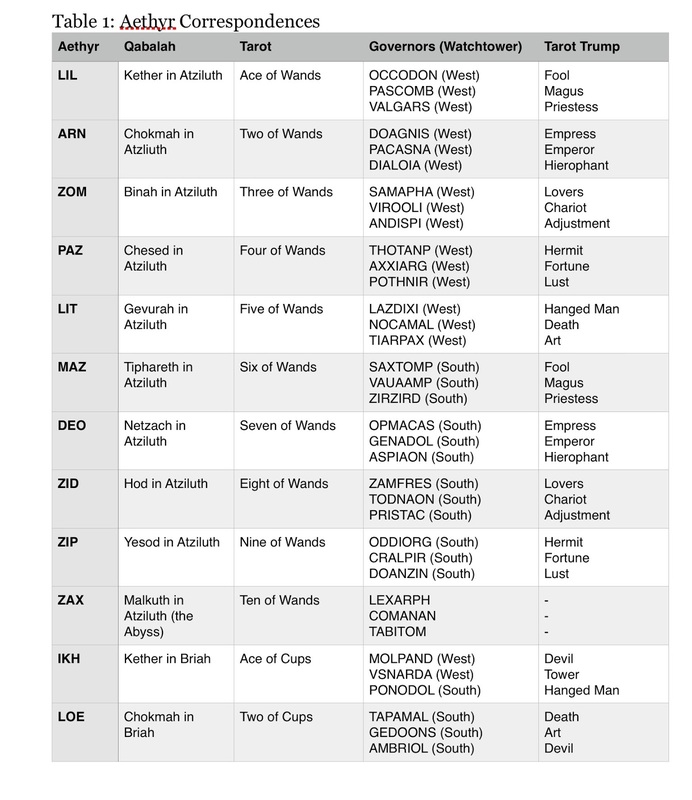 The following tables have been prepared to demonstrate some of these correspondences.